CW4 (R) Terry Westbrook presents scholarships to two 2018 graduates of Garner Magnet High School in Garner, NC. Bennett Dawson was presented with the Walter R. Freeze Memorial Scholarship ($1000) and plans to attend NC State University. Marcos Edge is this year’s recipient of the Outstanding High School Senior Scholarship ($10,000) and plans to attend Wake Forest University. These funds will help these students further their higher learning. Congratulations to Nathaniel Monroe, son of SFC Brian Monroe with the Walter R. Freeze Memorial Scholarship ($1000). 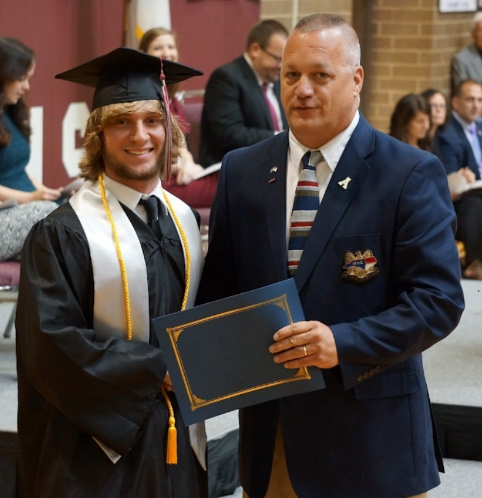 A 2018 graduate of South Caldwell High School in Hudson, NC, Nathaniel plans to attend Lenoir-Rhyne University and is being presented with his award by CSM Reggie Hill. MSG James McKee presents Alexandra M. Webb, daughter of CSM Brian Webb with the Elmer C. Hardison Memorial Scholarship ($1000). A 2018 graduate of Richmond Senior High School in Rockingham, NC, Alexandra plans to attend UNC-Chapel Hill.